Seen here in the lower esophagus (which has been turned inside out at autopsy) are linear dark blue submucosal dilated veins known as varices. In patients with portal hypertension (usually from cirrhosis of the liver) the submucosal esophageal plexus of veins become dilated (to form varices). 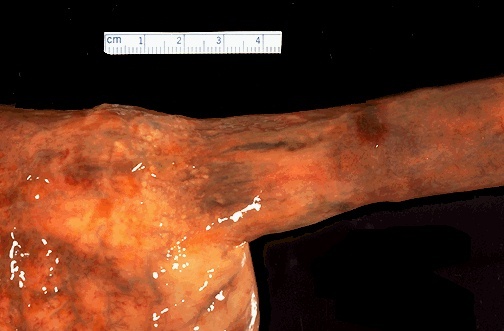 These superficial varices are prone to bleed.